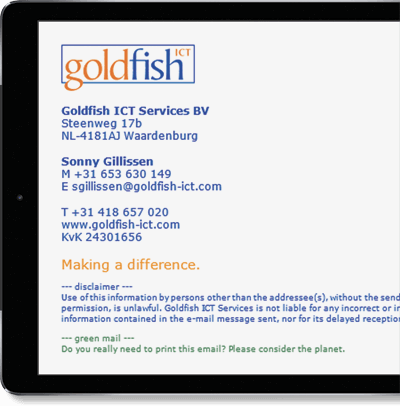 Goldfish ICT Services is a specialized consultancy for the food, pharmaceutical and agricultural industries within the Benelux region of Europe. Since its founding in 2000, the organization has enabled companies within these sectors to implement ICT solutions that incorporate professionally designed processes and strong administrative support systems. This is to assist these knowledge-intensive industries in responding quickly to strict framework changes and updates to national/international regulations. Goldfish is consistently named as the ‘SAP Partner of Choice’ from SMEs to multinational corporations across Benelux. It’s user friendly, offered all we needed and isn’t that expensive. Goldfish, at the time, did not have a system in place to centrally manage Office 365 signatures across the whole organization. From a brand and compliance perspective, this meant that users were utilizing their own designs that did not comply with corporate standards. It was clear that this needed to be addressed. However, the IT department was relatively small, so setting up a companywide policy on email signatures and implementing it would take a lot of time, plus there are inherent limitations managing signatures through Office 365 Transport Rules alone. The fact that the service used a cloud management portal was an important consideration when deciding upon Signatures for Office 365 as it meant Goldfish did not have to invest in an on-premises server. This would have been an additional hardware cost that would have made this signature project more expensive than required.